Tender No. 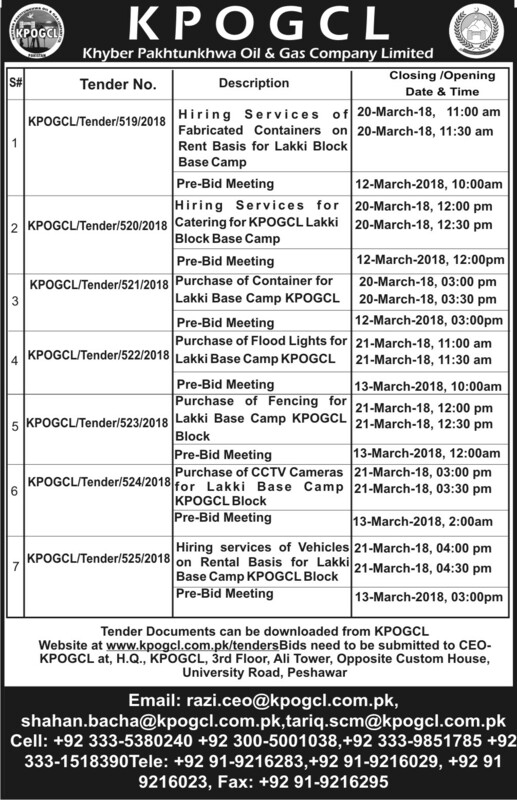 519, 520, 521, 522, 523, 524, 525 for Lakki Block Base Camp - KPOGCL - Oil And Gas Company Ltd.
Tender 519 Fabricated Containers on Rent for Lakki Block Base Camp. Tender 521 Purchase of Non-Furnished Shipping Container Seaport. Tender 522 Purchase of Flood lights for KPOGCL Lakki Base Camp. Tender 523 Purchase of Fencing for KPOGCL Lakki Base Camp. Tender 524 Purchase of CCTV Cameras for KPOGCL Lakki Base Camp. Tender 525 Hiring Services of Vehicles on Rental Basis for Lakki Base Camp.